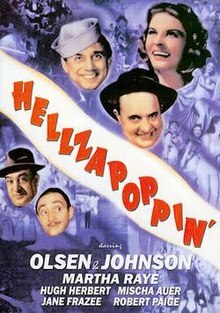 Hellzapoppin' is a 1941 Universal Pictures adaptation of the musical of the same name directed by H.C. Potter. The cast includes Ole Olsen and Chic Johnson (who produced and starred in it on Broadway), Martha Raye, Mischa Auer, Shemp Howard, Whitey's Lindy Hoppers and The Six Hits. Shemp Howard begins the film as the projectionist of a cinema, displaying on its screen what appears to be the start of a song-and-dance number whose classily dressed performers walk down a staircase - which collapses as in a fun-house ride, sliding them all straight to hell, where they are tortured by demons. Ole and Chic arrive in the midst of the mayhem by taxi, and after a bit of funny business step back to reveal that it's a movie sound stage. They work for Miracle Pictures, a company using the slogan "If it's a good picture, it's a Miracle!" A mousy screenwriter (Elisha Cook, Jr.) outlines his script for the screen adaptation of Hellzapoppin', and the rest of the movie depicts Cook's script. Among the topical humor is Johnson picking up a sled named "Rosebud" and saying "I thought they'd burnt that" (Olsen and Johnson were friends of Orson Welles, whose film Citizen Kane closes with Charles Foster Kane's childhood sled being burnt). The film has a frenetic pace, and often breaks the 'Fourth wall', including inner 'fourth walls' introduced by its nonlinear, metafictional narrative. The 1942 Academy Award nomination for Best Song for "Pig Foot Pete," (which lost to "White Christmas"), was attributed to Hellzapoppin', but the song never appeared in the film -- it was actually performed in another Universal production from the same year, the Abbott and Costello film Keep 'Em Flying. The film has a 5-minute long Jazz and Lindy Hop dance sequence at approximately the 48th minute of the film. The dance routines are performed by an African-American dance group known within the film as "The Congaroo Dancers" (known in reality as Whitey's Lindy Hoppers). The dance sequence moves at a frenetic pace and shows a lot of very athletic dance moves. ^ "Hellzapoppin'". The New York Times. Retrieved August 17, 2008.